Beef tenderloin is a large cut of meat right out of the short loin section. It is the center of tenderness. This makes it one of the most popular cuts. This also makes it one of the most expensive cuts as well. Whole trimmed tenderloin can weigh in around 6 pounds and cost as much as $100 or more. If you had the same amount of meat cut into steaks it can cost even more. Shop around to try and keep the price down. Tenderloin is easy to trim so if you can get it untrimmed for less go for it. To trim beef tenderloin start by removing the silvery skin. This cooks up very tough and makes dealing with the tenderloin difficult. This is similar to removing the membrane from ribs. Try using a paper towel to get a good hold on the skin while you use a knife to lift it away from the meat. Then remove any excess fat that might be hanging loose. From here you can either cook the tenderloin whole or cut it into steaks. 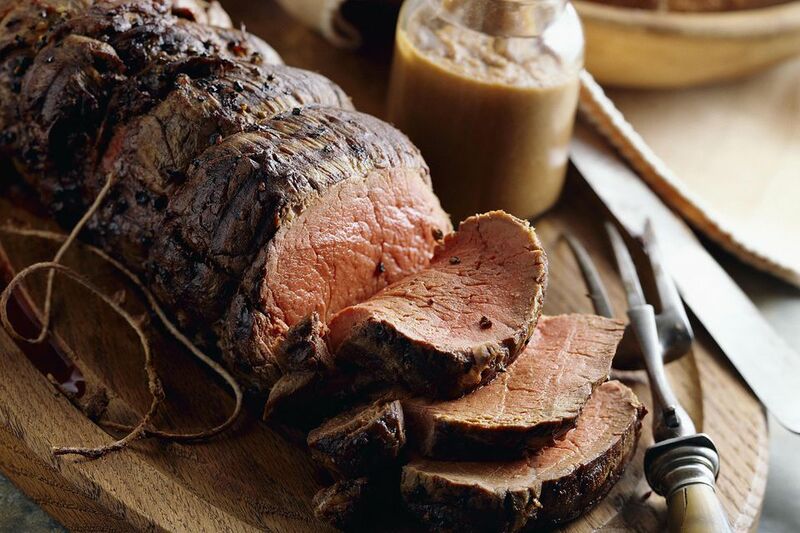 If you want to grill it as a roast you should tie up the tenderloin into an even, round roast. This will help it cook evenly. Tenderloin should have a nice caramelized surface so start out by searing the roast on a medium hot grill just long enough to lightly brown the surface. Move to indirect grilling and finish it off over a low heat. Plan on about 15 to 20 minutes per pound of meat with a low temperature and an additional 15 minutes of resting time. Remove the tenderloin when it has reached an internal temperature of 125 degrees F. Cover and let rest for 15 minutes. It will continue cooking during this time and the temperature will rise about 10 to 15 more degrees. If you want to cut your tenderloin into steaks then the grilling will be easy. As with any steak sear it over a high temperature for about 1 minute per side. Reduce the heat and continue grilling until done. Depending on the thickness the remaining cooking time can be anywhere from about 2 minutes per side to 5 minutes per side. Always use a thermometer to get the temperature right. Allow steaks to rest for about 5 minutes and plan on the temperature rising about 5 more degrees after you take it off the grill. Since a good beef tenderloin is both tender and flavorful it won’t need a lot of seasoning. Try a little black pepper, garlic and maybe a very light coating of a flavored olive oil. Anything more will simply detract from the flavor of the meat. Beef Tenderloin: Sure, It's Tender, But Does It Actually Taste Good?